Those who make emulsions recognise that systematically changing a surfactant blend changes the stability, for reasons that involve either handwaving or incomprehension. In a tour-de-force, Kiran and Acosta came up with a model that describes emulsion stability in terms of HLD-NAC, starting with the observation that emulsions are least stable when HLD=0. This expert-level app includes not just the basic theory but the effects of creaming and Ostwald ripening. Take your time; it's heavy going, but rewarding. Although this equation has its limitations and others might be chosen, it is adequate for our purposes. Note that in addition to the obvious importance of rpm and impeller diameter, γOW which, of course, is controlled via HLD, is very important. This equation is valid for systems where the ratio between the viscosity of the dispersed drop and the viscosity of the continuous phase is approximately 1. Systems that have high or low viscosity ratios are more difficult to emulsify and the resulting drop sizes are substantially larger than the values predicted here. The equations included in this app to calculate emulsion stability assumes that this separation is controlled by coalescence (default case). The coalescence time is calculated based on the collision-coalescence-separation (CCS) separation model of Kiran (Sumit Kiran PhD thesis: Application of the HLD and NAC models to the formation and stability of emulsions, 2013) developed in the Acosta group at U. Toronto. To build up your understanding of what is going on, you can choose to plot the settling time, the emulsion drop radius or the interfacial tension. The app introduces a modification to the CCS model by considering collisions driven by settling or creaming, which are more appropriate for larger drops. If the creaming velocity is sufficiently high for drops to coalesce in timescales shorter than that from the Brownian motion (which is very large for large drops) then you see a "creaming" fall-off of the stability. The creaming velocity depends on the density difference between oil and water. If these are set equal then no creaming effects can take place. The app compares the characteristic collision time considering Brownian motion (Davies and Rideal) and settling/creaming. The lowest characteristic time is used as the pre-exponential of the activation energy term. The app also considers the time to double the volume of a drop (similar to the coalescence of two drops of the same size) according to the Ostwald ripening mechanism. Again, the shortest time between the coalescence model and the Ostwald ripening is presented in the total calculation of stability. The Ostwald time depends on a Diffusion coefficient (assumed to be 1E-06 cm), a molar volume for the oil (assumed to be 200cc/mole), and the solubility of the oil, c in mole %, in the aqueous phase. This final value is the great unknown. It is certainly increased if the surfactant is inefficiently sitting in micelles able to transport the oil. At this level of precision it's probably best simply to see what sort of value of c is needed to cause a significant wing shift, then you can worry about whether those sorts of concentrations are likely to be realistic. If either creaming or Ostwald effects create a tail then the appropriate term appears on the graph. The NAC Viscosity Correction option allows you to show the likely effects of the viscosity increase that arises near HLD=0. As shown by Acosta (Sumit K. Kiran and Edgar J. Acosta, Predicting the Morphology and Viscosity of Microemulsions Using the HLD-NAC Model, Ind. Eng. Chem. Res. 2010, 49, 3424–3432), as the microemulsion drop size (not the emulsion drop size!) increases near to HLD=0, viscosity increases via a Doi and Edwards model for the interactions of ellipsoidal nanodrops. The equation breaks down close to HLD=0 so the viscosity is capped at 5* the original viscosity. This increase in viscosity is well-known experimentally though its effects on emulsion stability are less well-known and alarmed experimentalists might have smoothed out some "anomalous" data points. Given that a typical surfactant will be present at >1% (>10g/l) and that many emulsions have drops >1µm, the amount of surfactant is rarely limiting. There is one more subtle effect. 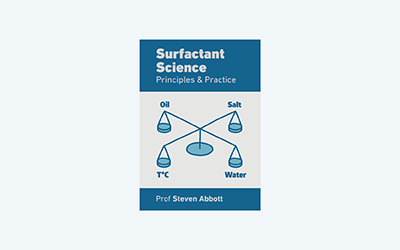 When the concentration of surfactant plus solubilized oil is less than ~0.4% then the osmotic pressure stabilisation ceases to be significant. As you go down to low surfactant concentrations the stability curve can show strange spikes when the diminishing solubilisation of the oil ceases to compensate for the low level of surfactant.